Midtown gets a bad rap for being a food wasteland -- largely thanks to the crowds of office workers who willingly spend their lunch hour waiting in line at mediocre build-your-own-salad chains, shuffling through depressing deli buffets, or overpaying for bland, prepackaged sandwiches. But it doesn’t have to be that way. Midtown has plenty of actually good lunch spots, ranging from Neapolitan pizza to fiery Isan Thai food to beautiful Nordic grain bowls. Here are some of the neighborhood’s best lunch options, from grab-and-go joints to sit-down, take-a-full-hour destinations. The original Alidoro, a tiny Italian sandwich shop that opened in 1986 in Soho, has a major cult following, so it was big news for the Midtown lunch crowd when it opened an outpost on 39th Street back in 2014. This place is bigger than the original, and the menu has expanded to include some salads and a build-your-own sandwich option (strictly forbidden at the original). 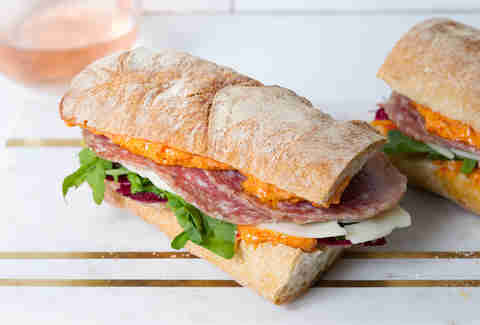 But it’s the sandwiches with names like Sofia, Marcello, and Enzo you want to go for, each a perfectly balanced package of ingredients like soppressata, capicollo, fresh mozzarella, roasted peppers, and arugula. This little Latin American lunch counter is one of your best bets in the neighborhood for a cheap, satisfying meal. It’s semi-hidden inside the freight entrance to a building on 37th Street, but a blue sign above the door points the way. Here, six or seven bucks will get you a plate of rice, beans, and one of several proteins like deliciously tender stewed chicken or roast pork. Don’t skip the hot sauce, and be prepared to pay cash. 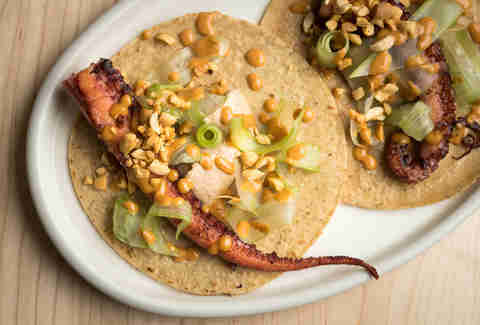 The newest outpost of Chef Alex Stupak’s modern Mexican empire is about way more than just tacos. But do note, it’s also not the kind of place you go for a quick, cheap, burrito lunch (there’s Chipotle for that). Here, you can order à la carte off a lunch menu that ranges from hash brown tacos with tomatillo ketchup to $125 A-5 beef fajitas -- or get the $35 prix fixe, which gets you a starter, two tacos, and a dessert (unfortunately not the insane ice-cream-that-looks-like-an-avocado dessert, though -- you’ll have to go à la carte for that). Sometimes you just want to go in on some Chinese takeout with a few coworkers. When that happens, Szechuan Gourmet is your spot. 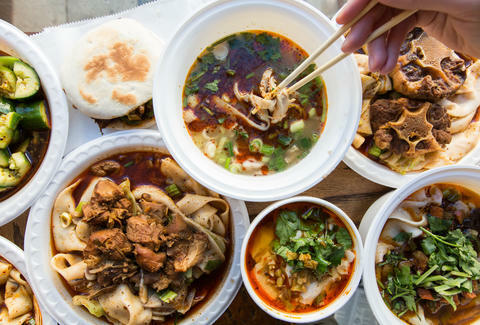 The menu is long and broad, so beef and broccoli fans can get their fix, but the best dishes are the Sichuan specialities like mapo tofu, dan dan noodles, and double-cooked pork belly. These come laced with a fiery blend of chiles and Sichuan peppercorns, and are guaranteed to perk you up in a way that a pile of fried rice never can. There are only so many build-your-own salads a person can eat before the yearning kicks in for a good burger and fries. 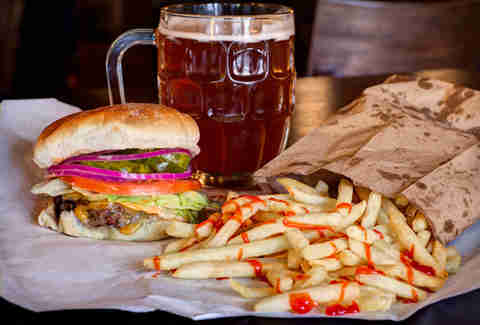 Luckily, there’s Burger Joint, an unpretentious spot tucked not-so-secretly behind a velvet curtain at the Parker Meridien Hotel. The burger itself is everything you want after a week of chopped romaine: juicy patty, Cheddar cheese, lettuce, tomato, pickles, onion, and all the condiments on a squishy potato bun. Fries are extra but obviously necessary. 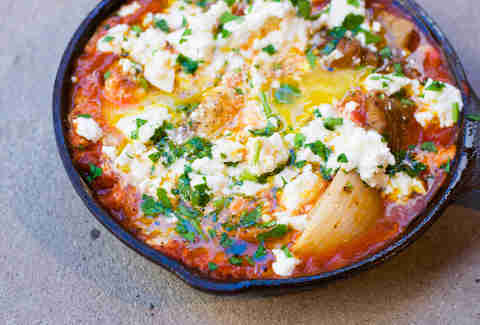 This Greek food truck is easy to spot not only thanks to its bright, ocean-blue exterior, but also because of the line usually stretching back from the window. 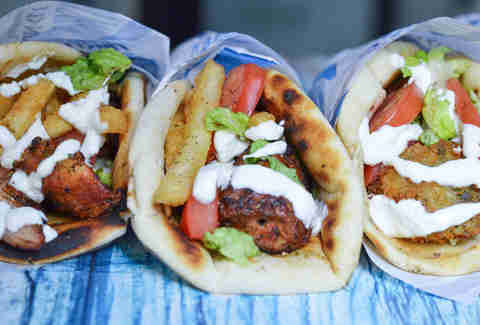 They’re all there for the fresh salads, the flavorful grilled chicken or pork souvlaki, and the extra-crispy herb-seasoned French fries, which you can get on a platter, stuffed into a pita, or in pretty much any combination you want (souvlaki over salad? Sure. Chicken over fries? You got it). This Scandinavian food hall inside Grand Central is the work of Claus Meyer, the co-founder of Noma and a huge player in the Nordic food scene. This is the place to go for fresh, nutritious, sustainably sourced food that’s way more interesting than anything you’ll find at Pret a Manger. 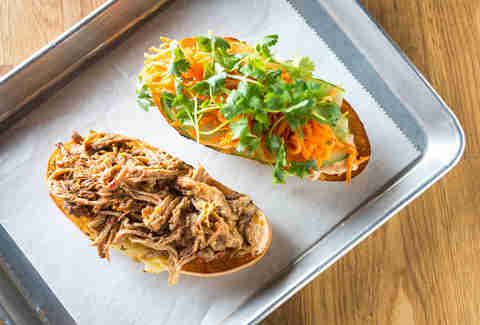 Among the stands, you’ll find grain bowls, smorrebrod (open-faced rye bread sandwiches) topped with things like smoked salmon or beef tartare, and house-made Danish hot dogs loaded with toppings. You should probably also stop at the pastry stand and grab a cinnamon twist on the way out. The Midtown outpost of Momofuku king David Chang’s growing fast-casual empire has the widest ranging menu of any of them. 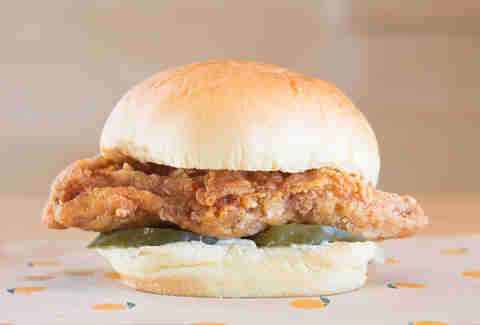 That means, even if you get bored of its exemplary $8 spicy fried chicken sandwich (unlikely), you still have plenty of lunch options, ranging from a bacon ranch salad to smoked trout dip to a kimchi bacon burger. Fuku+ is also located in the Chambers Hotel, right alongside Chang’s other Midtown restaurant, Má Pêche, which is great for a more formal, sit-down lunch if that’s what you’re after. 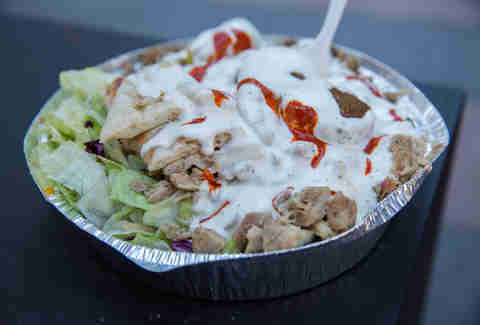 In a part of the city where you can find a food cart on every corner, it’s still worth walking the extra blocks (and waiting in line) for lunch at the flagship Halal Guys cart. The city’s most famous halal purveyor is the best place around to get a reliably filling container of chicken and/or lamb over rice for under $10. Go easy on the hot sauce (it’s crazy hot), but go all in on the white sauce (it’s garlicky and delicious), and don’t worry, the line moves fast. A dollar slice is fine when you’re desperate, but for actually good pizza in Midtown, head to Don Antonio. This narrow pizzeria is equipped with a wood-fired oven helmed by two Neapolitan pizza stars, and offers a huge menu of options. All of them are good, but treat yourself to one of the signature montanara pizzas, made with dough that’s lightly fried before being topped with tomato sauce and smoked mozzarella or pork and Parmesan, then baked. The restaurant also offers a whole bunch of gluten-free pizzas if that’s something you’re looking for. 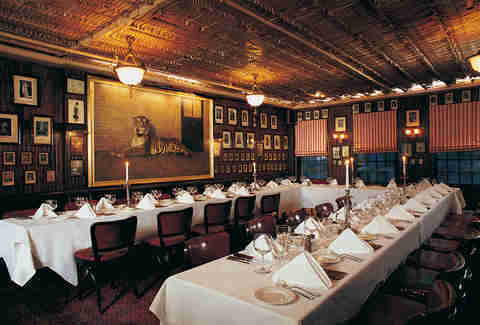 Keens, open since 1885, is one of the city’s oldest and greatest steakhouses, and lunch here is guaranteed to make you feel like you’re Don Draper. This is not a quick, grab-and-go situation -- this is a white tablecloth, steak, and maybe a martini type of lunch. If you’ve got the time and cash to spare, go ahead and get the legendary mutton chop, but lunch is also a great time to try Keens’ dry-aged burger or the insanely good prime rib hash -- an ultra-crispy disc of fried potatoes laced with rich chunks of beef. Rather than eat another Seamless order of mediocre pad Thai, pay a visit to Larb Ubol. It’s one of the best Isan Thai restaurants in Manhattan, specializing in the fiery, funky dishes of Northeastern Thailand. To that end, the restaurant’s excellent lunch special includes either a papaya salad or chicken larb (a spicy minced meat salad) alongside dishes like crispy pork over rice, or steamed chicken with ginger rice and herbs for $9 or $10. You can also find a good pad Thai here if that’s what you really want. This old-school Cuban lunch counter is the best place in Times Square to get a hearty meal for $10. The classic Cubano -- a hot, pressed sandwich piled with roast pork, ham, salami, Swiss cheese, pickles, mayo, and mustard -- is always a good lunchtime move, but you can also get a big plate of rice, beans, sweet plantains, and tender roast chicken for about the same price. The modern Cambodian sandwiches at this hit mini-chain are a lot like Vietnamese bánh mì: light, crusty French bread, a pile of sliced cucumber, pickled carrots, cilantro, and a swipe of chili mayo are the foundation of every sandwich. But from there the fillings get creative, ranging from five spice-glazed pork belly to coconut tiger shrimp. Even the vegetarian options -- like roasted cauliflower with eggplant spread -- are great, and you can also get most of the sandwiches as a grain bowl or a salad if you’re looking for something lighter. The set lunches at elegant Japanese mini-chain do not come cheap -- most will run you $25 or $30 -- but for the quality, they’re well worth the splurge. You won’t find straight-up sushi rolls here -- instead, you can choose from dishes like tonkatsu (fried pork loin) or bowls of sashimi over rice. Everything comes on an elegant tray with a cup of miso soup, a little dish of pickles, and a silky chawanmushi (savory egg custard), making most other lunch combos seem lackluster in comparison. Just because you want to eat something good for you doesn’t mean you should have to wait in line for a halfway-decent chopped salad. 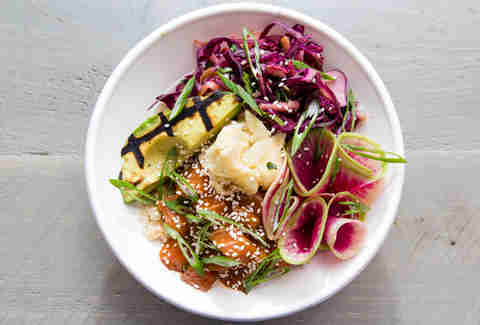 Instead, there’s the Little Beet, a health-conscious little fast-casual spot that lets you build your own plate out of dishes like ponzu-marinated salmon, white beans in herb salsa verde, and slow-roasted beets with turmeric yogurt. There are also cold-pressed juices, poke bowls, and enough gluten-free or dairy-free or vegan options to accommodate every dietary restriction. You could just microwave a packet of instant ramen, but why would you ever do that when there are three outposts of Totto stretching from Hell’s Kitchen to Midtown East? All of them specialize in paitan ramen, made with a rich chicken broth (though a vegetarian option is also available), with a simple menu that’s all about the toppings. The add-on choices range from char siu chicken to avocado to garlic paste, and there are enough of them that you could eat a different bowl of noodles every day of the week. This food hall across from Grand Central is the perfect place to go if you’re trying to find lunch for a big group of variously picky people, or if you’re just feeling hungry and indecisive. Wandering through the food stalls, you’ll find something for everyone: lobster rolls from Red Hook Lobster Pound, pizza from Roberta’s, smashed burgers from Hard Times Sundaes, or silky swirls of hummus from Mimi’s Hummus. You could come back here every day for two weeks and still not have tried every stall. There are tons of great restaurants in Koreatown, but one of the best for a quick weekday lunch is Woorijip. At its heart is a buffet table, where you can grab a tray and load up on fried chicken, spicy salads, kimchi fried rice, and more for just $8.99 a pound. There are also prepackaged meals of kimbap (Korean sushi rolls), hot soup, and more if you want an even quicker meal to-go. 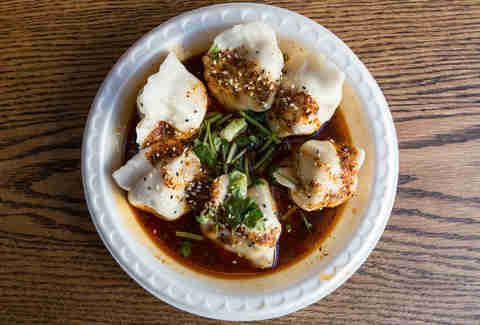 Xi’an is now a hugely successful chain, with locations all over the city, but the quality of the food and the prices haven’t changed much since it was a single, Anthony Bourdain-approved hole-in-the wall in Flushing’s Golden Mall. A spicy cumin lamb “burger” (made with sliced, stir-fried lamb instead of a patty) is just over $5, and a big plate of chewy hand-ripped noodles tossed with meat, vegetables, and a spicy Sichuan peppercorn-laced chile oil will only set you back around $10. Marguerite Preston is a writer and editor who works in Midtown and actually doesn’t mind it.